I need to remind you that I did not use multi tier architecture here. I highly recommend that Accessing to database should be done through DataAccessLayer you can find more information about DataAccessLayer and multi tier programming in my blog. 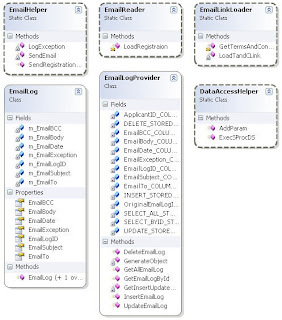 UI will call EmailHelper class methods to send email in our case we have just one type of email if I had 10 different emails (of course with different content) I would have 10 methods to send Emails. All of those 10 methods would use SendEmail method (a private method) to send email. Also in this class there is another method called LogException used to Log the exception in database. Meanwhile, the email information is being saved so we can send email in later step to client. In this method an object of email log is being created then it is passed to EmailLogProvider Insert method to insert into database. DataAccessHelper is a utility class that you may use to add parameter to a command and to run a storedprocedures. In our example it is being used by EmailLogProvider class. When a method of EmailHelper is being called to send an email first a MailMessage object is created afterwards, it is passed to EmailReader class to prepare the body and other information. In this method we load information form an Xml file. So it is highly maintainable because as long as client gets back to us to change content of email we can apply those changes in this xml file not to our code. Take a look of this xml file. As you see we even have "from emai"l and "from email display name" also as many as required bcc email can be configured. A very nice trick in this code is that if you look closer to the xml file you will find $firstName$ . This is a key for our code and we will replace this value in EmailLoader.LoadRegistration .So the email can have dynamic information for example another good example is that you may want to send username and password to a user but this information may vary from one user to another user so we use other keys and we replace this information in our code exactly the same way for $firstName$. In most of the sites that I worked I had more than one email also many of them had some special links like Terms and Condition link that should be placed into email. A good practice always suggests that never put a link hard coded as long as you have more than one email content connecting to the same link. So imagine you have 5 email and all of them somewhere in their content have a link to Terms and condition. You better make this link configurable because when this link changes you need change just one configuration rather than looking for this link in all emails. So EmailLinkLoader actually load another xml file and find the link address then cache this information. So next time it does not need to look up link again. This link information is passed to EmailReader to be applied to body content. Open Visual studio and form file menu select open web site and form file system select the project folder. Afterwards you can run the project. You need to apply smtpserver address. A good test is without applying smtpserver if you run application then application ask your first Name and your email address. Afterwards since sending email is not successful the email information is saved into database. And it shows you unsuccessful message. 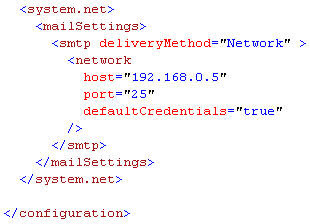 In later steps we can use EmailLogProvider class and load all EmailLog objects so we can retry and resend email.